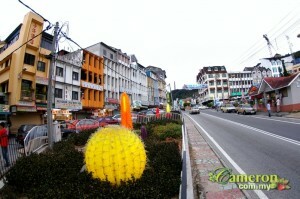 Brinchang is definitely one of the main tourist towns in the cool mountains. You’ll see abundant of hotels in shop lots, steamboat restaurants serving buffet and ala carte authentic Chinese cuisines, souvenir shops, fast food chain, bank and the famous night market. The road between pasar malam and Cactus Valley becomes alive when the night comes as rows and rows of stalls would be set up for the night market. From snacks to local tea products, as well as souvenirs and clothes, you can pretty much get anything here. Since the parking lots are public in Brinchang, those who opt to stay in hotels in shop lots might have a hard time getting a parking space. Motorists who park randomly by the roadside risk getting a police summon(during super peak days only). On days when there is heavy traffic, you’ll see police officers directing the cars to reduce congestion along the main road of Brinchang- Guardian pharmacy, rows of steamboat restaurants, souvenir centre and grocery stores. There are plenty other shops behind the main road. You name it, they got it – bookshop, Hotlink shop, optometrist shop, vegetarian restaurant, bank, budget accommodations, reflexology, café and Malay restaurant. Among the new shops in Brinchang town is Brinchang Square which is a project under the LBS development group which comes with 40 units of 5 storey premium shops completed with individual lifts and private parking spaces. Located near to the highly popular pasar malam in Brinchang Town, Brinchang Square is one of the most sought after shops in Cameron Highlands. Last minute shopping can be done by paying a visit to Brinchang Central Market or CT Craft Centre. As usual, you’ll get the usual Cameron keep sake items in the central market such as magnet, T-shirt, strawberry balloon and strawberry keychains. CT Craft Centre is worth a visit for you’ll get rare crafts made by Orang Asli, plenty of wood wind chimes and weaved bags. The centre is closed on Tuesdays. And of course, police station, fire brigade and post office are also located along the main road. As for banking, there is only one bank in Brinchang which is Public Bank Berhad. Public Bank Brinchang is located next to Hotel Rosa Passadena.